Last weekend, impulsively, my best friend and I decided we needed a weekend getaway. 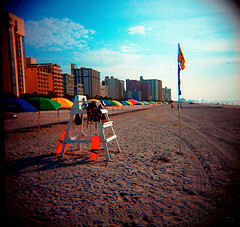 We settled on Myrtle Beach since we were in the mood for some swimming and water sports. We packed a few items, booked a hotel room online, hopped in the car late Friday night and were on the beaches in less than a few hours. It was just what the doctor ordered since the weather was perfect and my stress from the week melted away instantly. We enjoy delicious food, adult beverages, swimming, beach volleyball, and we met up with a great group of people, who were originally from our town! Sneaking off on this getaway benefited us both immensely!